I must have had some kind of cosmic connection with Elise of Simply Recipes the other day. My boyfriend smoked a huge beef brisket and I do mean huge. He was so happy because we had gone to our butcher that day and he asked our butcher to cut us a nice brisket. Of course the butcher was more than happy to oblige and subsequently cut us this gigantic cut of meat. Well, one look at that brisket and I could see the love in my boyfriends' eyes. When we got home I tried with brut force to make him cut the brisket in half and freeze it for later, after all, it was only for the two of us. Not a chance, he was determined to make the whole hunk of meat, and he did. I immediately began planning leftover brisket recipes for the next week. One visit to Simply Recipes and suddenly I wasn't so apprehensive at the thought of having major amounts of leftover beef in my fridge. A BBQ beef sandwich was in my immediate future and I couldn't have been more excited about it. Do yourself a favor and check out the mouth watering photo that Elise has of her sandwich. Or don't if you already have plans for dinner tonight. 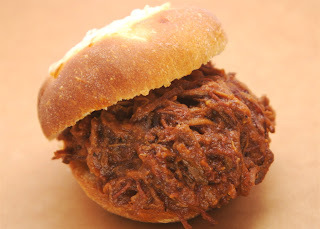 Trust me, one look and you'll want one of these fantastic BBQ beef sandwiches like, yesterday. In a large, heavy pot, heat olive oil on medium heat. Add the onions and cook until translucent, about 5 minutes. Add the tomatoes, roughly chopping them in the pot. Add the barbecue sauce, increase heat to medium high and simmer for 10 minutes. Add the chuck roast. Bring to a low simmer, cover and slow cook until meat is very tender, stirring occasionally, about 3 hours. Remove the meat from the pot. Use a fork and knife to separate the roast into small pieces. Set aside. Increase the heat on the pot to medium/medium-high, uncover, and reduce the liquid until thick. Stir often to prevent burning. Return the meat to the liquid in the pan. Warm both thoroughly. Add salt and pepper to taste. Serve on buns. Makes approximately 12 sandwiches. okay, now i want this for dinner instead of the nice healthy pasta salad i'd been planning. looks simple and delicious too!wow! Hi Y, I too love brisket in all it's forms. Do you have a favorite recipe? I dare you to make some crazy sculpture out of meat!!!! You guys are amazing. I love it! glad yo hear from you. Hope you're easing into the post-tastespotting days!